Ah, I think we should reflect on it. This is no one-liner because it would change the complete structure of setting cookies. 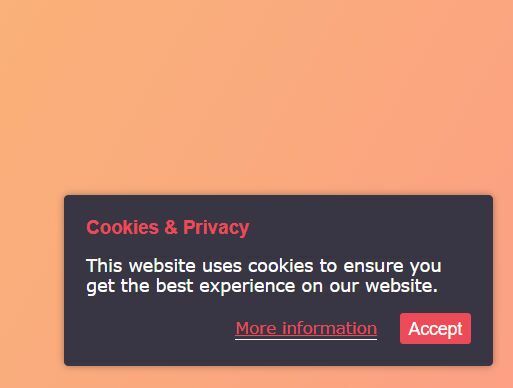 Additionally it's at least annoying up to disturbing because either the visitor sees this notice on every page because of ones non-acceptance of cookies (the script can't recognise the visitor on the next page) or the script has to set a cookie even the visitor doesn't accept cookies to prevent displaying the banner again and again (so the script can recognise the visitor on the next page). Do you talk about being an unregistered or a registered user, a moderator or an administrator? This is already implemented (in an admittedly inconsequent way). Registered users (independent from the rank) can be marked with the char "®" and the information if a user is a moderator or an administrator can be displayed when hovering the user name with the mouse cursor in the thread tree. Yes, this could be made in a smarter way. Sorry but "general users" doesn't change the general structure of the page(s). There is no difference between changing the template by generating new HTML-elements and pushing a button after generating the same new HTML-elements i.e. in a form with exception of the handling of this function. This could be purpose of a help page but the forum itself is not a blueprint with a legend. If the script allows to upload new file formats, it has to handle these new formats in a proper way i.e. by checking the upload for malicious file format and so on. That's nothing we can handle for all the file types. I say "all the file types" because you say now ZIP and tomorrow someone asks for support of PDF and another day someone asks for ".obj" which is a format for 3D-models or, to stick to 3D-models, an encrypted file format like ".block" (encrypted Blender file format) or for file formats, noone of us knows. Where to draw the line? I think, we can't and shouldn't try to implement a file storing function because we are able to implement a bunch of bugs and security holes by trying that. There are a plenty of solutions for file storing and sharing like NextCloud, DropBox and so on, where one can share files and release it to a group of people or the public. Adding a link to the download in a posting is IMHO the simplest and safest way.